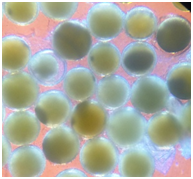 Live Decapsulated Brine Shrimp Eggs (Artemia franciscana)are processed using Dennis’s proprietary technique that actually increases the hatch-rate of brine shrimp cysts. The decapsulation process not-only removes the outer shell of the shrimp, it sterilizes the cysts to make sure there is no possibility of introducing unwanted organisms into your aquarium. Decapsulated cysts can be fed directly as a nutritious feed for fishes, invertebrates, or corals, or they can be hatched by aerating in warm seawater for about 18-Hours, after which they can be offered to small fishes and invertebrates as a live-feed to encourage young or newly-introduced fishes to begin feeding. Decapsulated cysts can be stored refrigerated for several weeks and remain viable.